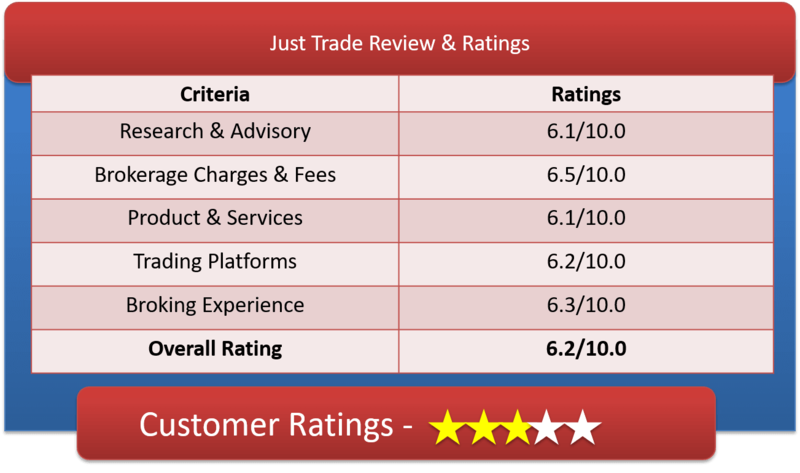 Justtrade.in is the web portal for their online Investment & Financial Services. This broker is member of NSE/BSE and also Depository Participant (DP) with NSDL. Apart from high quality investment advice from the experienced research team, the site offers real-time stock quotes, market news and multiple tools for technical analysis. This Broker has network of over 120+ offices in 70+ cities across India, under the name of parent company Bajaj capital. Customer service is good and reaches to client through toll-free number, phone and email. Option Brokerage is Rs 50 per lot. This plan requires Account Activation charges and Margin Money at the beginning of the plan period. In this plan if you are profitable in a quarter, you will get 80% of the brokerage back. Account opening charges are to paid and it will cost you Rs 710/- for first year. Thereafter you need to pay AMC of Rs 280/- from second year onward. Justtrade doesn’t charge for services like SMS alert and Call & Trade facilities as being charged by Discount brokers like Zerodha. Justtrade Demat Account is available under three schemes – Just Activ Basic, Just Activ Silver and Just Activ Gold. For initial account activation fees you are charged Rs 499 and Initial deposit of Rs. 10,000. Flat brokerage rates for delivery (0.4%) Intraday and future (0.04%) transactions is applicable. No charges for mutual fund transactions and for applying for IPOs. These are plans which provides you investment advice with zero brokerage charges for a nominal fee. Both the plans require annual subscription fees at the beginning of the scheme. How to open Just Trade Demat Account? Trading in Equity, MF or IPOs and services through a single Log in id. Variable brokerage and fixed fee based plans. Hi-tech and highly reliable online connectivity through V-SAT and Lease Lines. Personalized Relationship Manager to share Plan, Product and Research Expertise with the client. Access to Financial Assessment Services and Research reports on all asset class and capital market. It the secure online web portal of just trade. It provides facility to trade in Equity, derivative, mutual fund and IPOs on single sign in. This platform is terminal-based that provides two options for trading. First, you can use pull-technology whereby one can get to select a stock at a time check the quotes and can place your order or else you can use the browser based streaming quotes engine which will look like a dealer-terminal. Online Investment Platform fully integrated with DP; bank accounts built for active investors to transact in shares, futures, options, mutual funds and IPOs online with little paper work. It is an average broker that provides little bit of everything in their portfolio and lacks technology advancemant tools and platforms to compete with big names.